It's A Dan's World: NOW COMES THE COSPLAYER: Songbird, Absorbing Man and More! 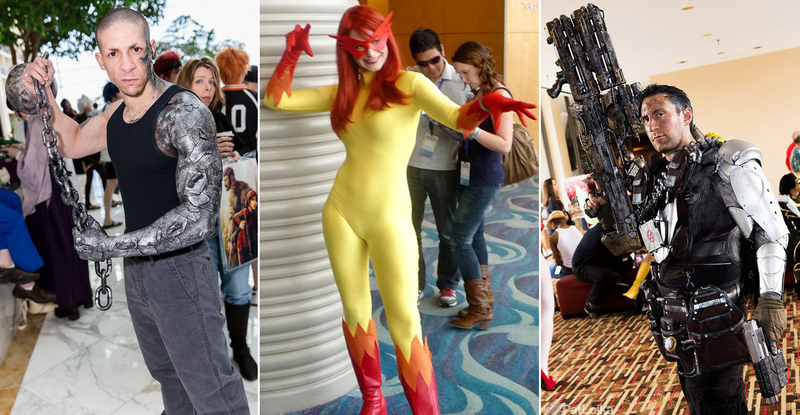 NOW COMES THE COSPLAYER: Songbird, Absorbing Man and More! Man, the Thunderbolts were sooo good before they went and got all all-star-ish. Founding member of the original impersonators here, Songbird / Screaming Mimi, shows their fans have staying power too. Hopefully 'Wind of the Stars' is happy to see Songbird back in the pages of Marvel's New Avengers title! More crazy cool costumes await on the very next page. One of my favourite comic images as a kid comes from Crusher Creel - The Absorbing Man, fighting the Hulk on the exterior of a spaceship, as it burns up re-entering earth's atmosphere. Physics, shemisics, that was flat out cool. While sometimes it feels like the classic Marvel villains go forgotten, this pic snapped at Katsucon 2015 by dtjaaaam proves I'm not alone! No wonder Spider-Man calls her an "amazing friend" if she looks like that! From the X-Men to the New Warriors to the Avengers, Firestar's, well... star was on the rise. Then the world focused on Nova, and all the other Warriors went into the can. Still, with a costume as classic as the one this 'Firestar' sports, Angel will never stay down for long (come on all-star line-up NW book)! Right now I am in the middle of a 'digging Cable heatwave'. Lately I've just been reading heaps of old Cable material, and really thinking about what an awesome creation the 'mutant Judge Dredd' is. As long as he doesn't have Hope. Having the character nurse a baby for years just watered the plot for me, especially as she didn't turn into Jean in the end (whoops, spoiler alert). Busted at DragonCon 2014, this cosplayer knows to ditch the bubba and keep the 'tude! You know, that Deadpool/Cable: Split Second digital comics was pretty awesome. You should check it out- they do some pretty awesome stuff with Cable and hearken back to his first meeting with Deadpool in a really cool way. I miss New Warriors!!! The last book they had out was good, with newer members and them fighting High Evolutionary. Lot of great Speedball moments...... but a new classic, or even all-star lineup would be AWESOME! Thanks King - I've already sold my copies of the last series of New Warriors - I think it found it's feet too late, although I liked where they were going with Speedball's inner penance and the return of Sil. It sadly seems like it is stuck in the same bog that the Titans are at DC. Either classic or bust. Will deffs look into Cable in Split Second. I'm not a digital fan, but you've twisted my nano infected arm. I liked 'em fine. Great villain to have them go against. Scarlet Spider back in the mix... Silhouette showing up. Hummingbird was cool. And of course: Jake Waffles!!! Speaking of The Warriors, though- "A man who, and I can't stress this enough; goes into battle with a skateboard": Night Thrasher is coming back in Contest Of Champions. Let me know what you think of Split Second. I'm not a digital fan either... but I consider it a must read for a Cable fan. so now we know what Vin Diesel would have looked like as The Absorbing Man. HA! I thought he looked like him too! Vin as crusher would be so cool - or The Rock - either way, I'm happy. These were all pretty damn good, Crusher Diesel too. Songbird was hot, but not as hot as Firestar though. Damn fine jobs on the costumes for all of them.